Hangman Tournament is the connected terminals points-based tournament version of JPM's hit SWP pub quiz game Hangman 2. The game is a multiple choice question and answer video SWP. Players of top-scoring games are rewarded with a big cash prize, or one of a variety of other valuable prizes that may be on offer. Hangman Tournament is based loosely on the traditional paper and pencil Hangman word game, and runs on both GamesNet and ItBox platforms.. Choose your CLUE and attempt to solve the MYSTERY PHRASE before you're lynched! Choose a LETTER and answer QUESTIONS to add to the phrase. Complete the phrase to win POINTS. Watch for MYSTERIES(?)! GOOD LUCK! Get your name in the HALL OF FAME! The more questions you answer, the higher your ranking! 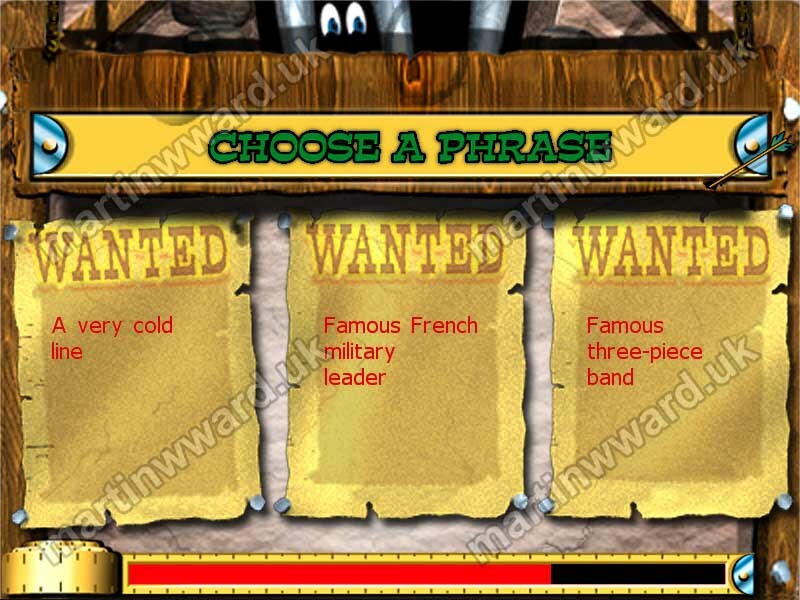 At the start of each game, the player is shown three WANTED posters. Each poster has a clue to a different Hangman phrase. The player must select one of the three posters. The player is then shown the main Hangman game screen. At the start of the game, the player's Hangman character has all six body parts missing. The clue to the Hangman phrase is shown in green above the phrase itself. Each letter of the phrase is represented by a purple tile. Initially all the tiles are blank. At the bottom of the screen is a selection of three letters to choose from. Each letter has a different question category associated with it. The game has a total of seven question categories. 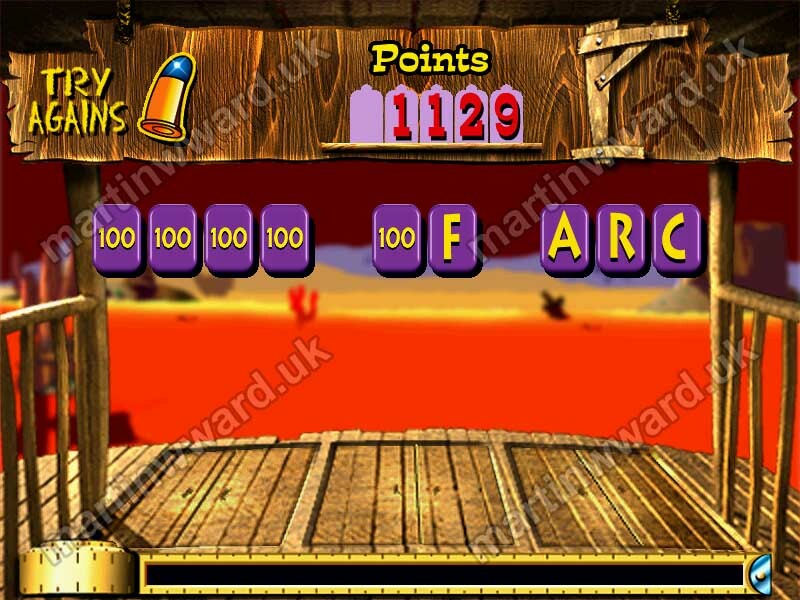 The player must choose one of the letters that they think is present in the Hangman phrase. There is a time limit for the selection, which is shown graphically by a shrinking red bar on the undertaker's tape measure at the bottom of the screen. If the player fails to make a selection within the time limit, one of the three letters is chosen at random. If the selected letter is NOT in the phrase, the chosen letter drops through the trap door beneath it, and a limb, or other body part, is added to the Hangman character. The player must then choose again from a fresh set of letters. 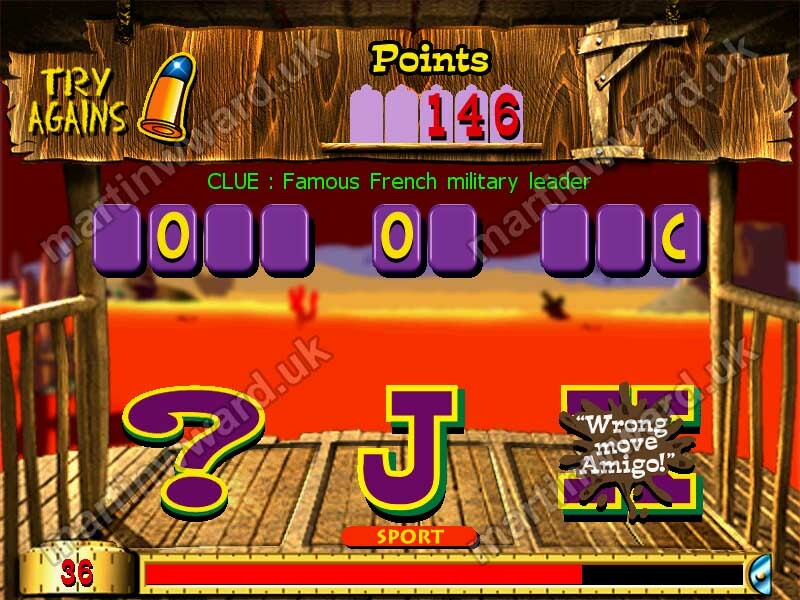 If the selected letter is in the phrase, the game progresses to the question screen. If the selected letter is a question mark (? ), a mystery bonus round is awarded. If the player's Hangman accumulates all six body parts, the Hangman is complete; the player is 'hanged', and the game ends. 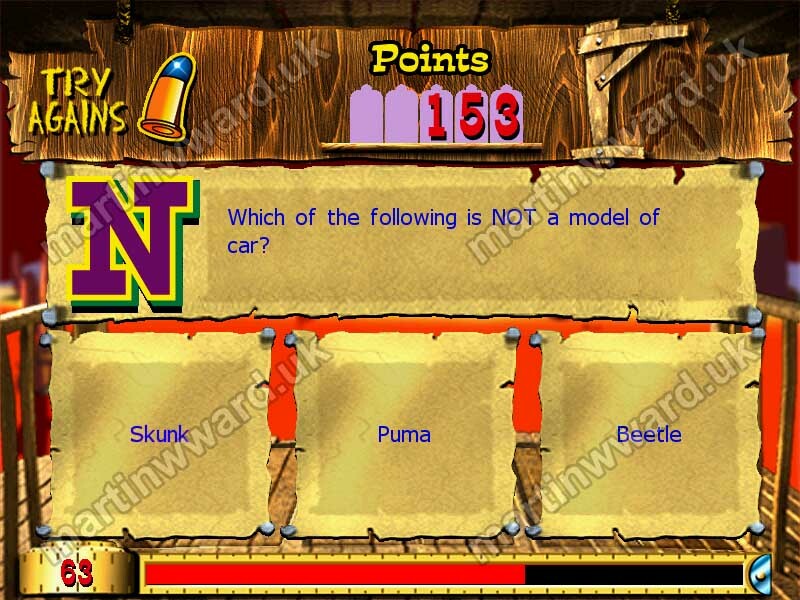 The player is shown a question from their chosen category together with three alternative answers, only one of which is correct. The player must choose the answer that they think is correct. There is a time limit for the selection, which is shown graphically by a shrinking red bar on the undertaker's tape measure at the bottom of the screen. There is also a points value on the tape measure, which counts down as the question time runs out. 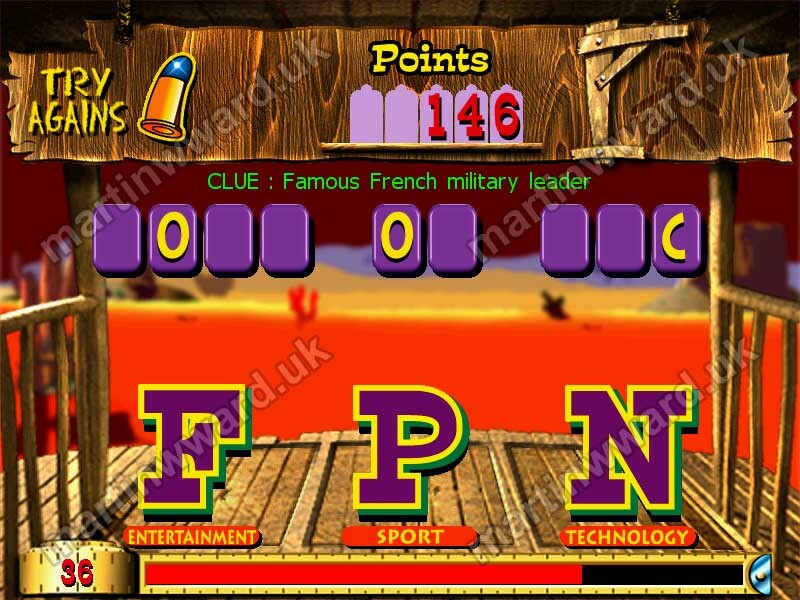 If the player selects the CORRECT answer, the player is awarded the current points value on the timer, the game returns to the main game screen, and all occurrences of the previously selected letter are revealed in the phrase. If the player selects an INCORRECT answer, and has one or more try again bullets remaining, they must try again. In the MYSTERY BONUS round, the player is briefly shown four WANTED posters, each with a different bonus prize. The bonuses on offer can be positive or negative, but there is always at least one positive bonus available for the player to choose. 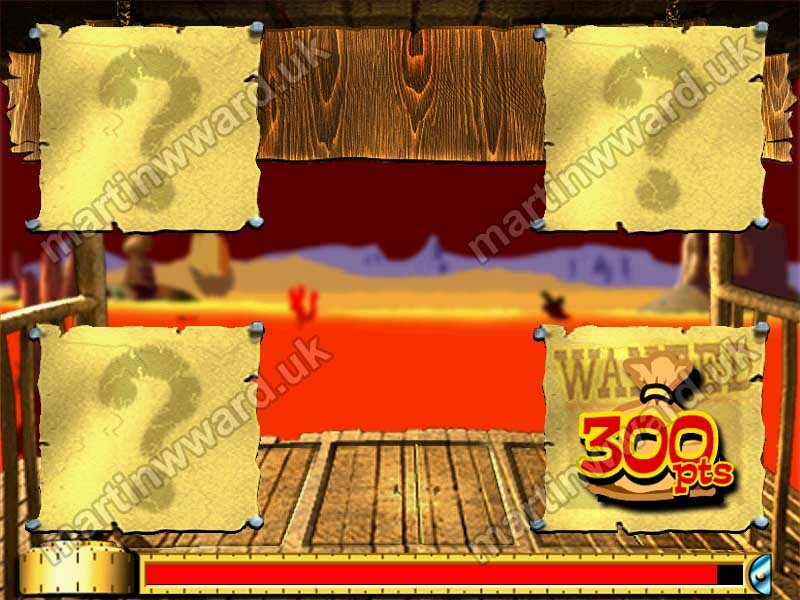 The wanted posters are turned over, and their bonus prizes hidden from view. The player must then watch closely as the four posters are shuffled. The player is asked to select one of the posters. The prize on the chosen poster is then revealed, and awarded to the player. COMPLETE PHRASE - the current phrase is automatically completed and the points for the phrase are awarded. After successfully answering a question, the game returns to the main game screen. If at this point the Hangman phrase is complete, the letter tiles turn over, one after an other, each revealing 100 points. The points for each tile are added to the player's total score. 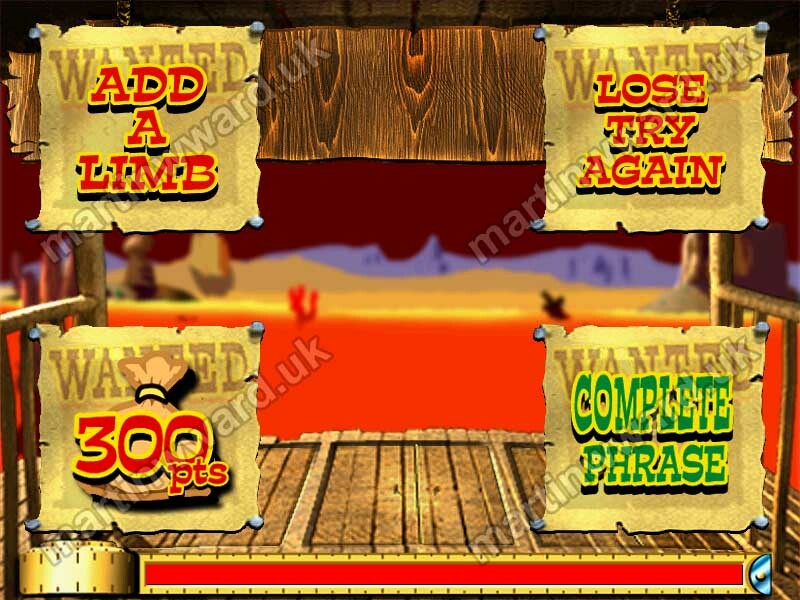 The game then returns to the phrase selection screen, and the player chooses a new Hangman phrase. 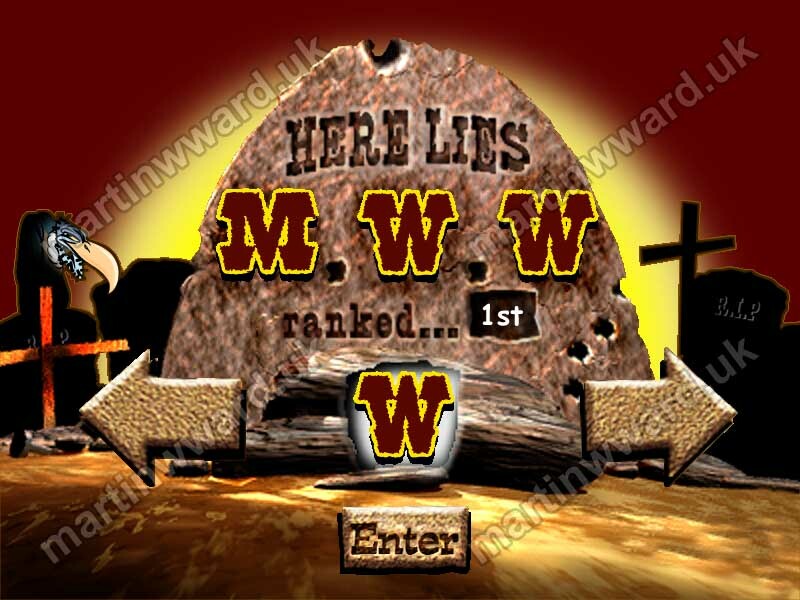 When the game ends, if the player has a high enough points total, they are shown their rank in the game's high score table, and asked to enter their initials. 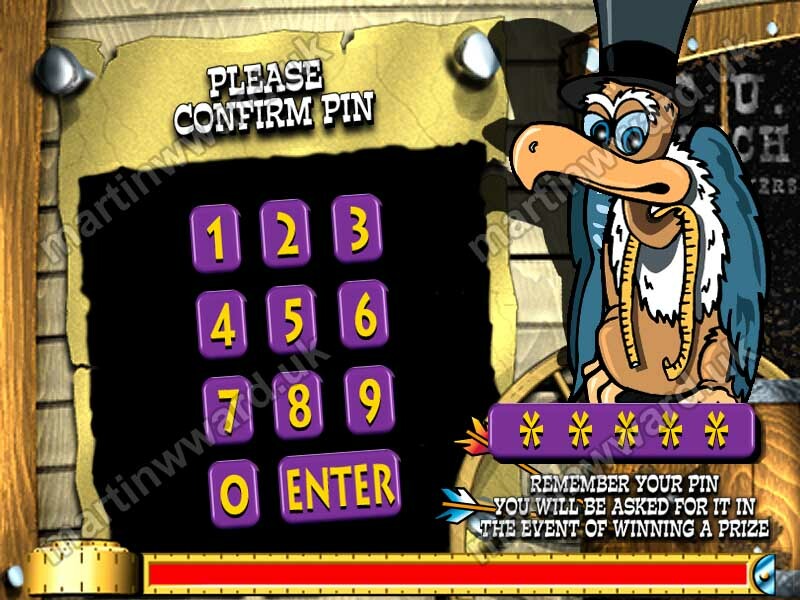 The player is also asked to create a PIN code. In the event of winning a tournament prize, the player will be asked to re-enter this code during the claim procedure. At regular intervals throughout each tournament, the central server collates the high score tables from each terminal to form an overall national high score table. Players can check this leader board at any time before the tournament ends. When a tournament ends, the central server takes the latest national high score table to form the list of national winners. If a player has won a prize, they can then claim it, using the PIN code that they previously used to enter their initials. 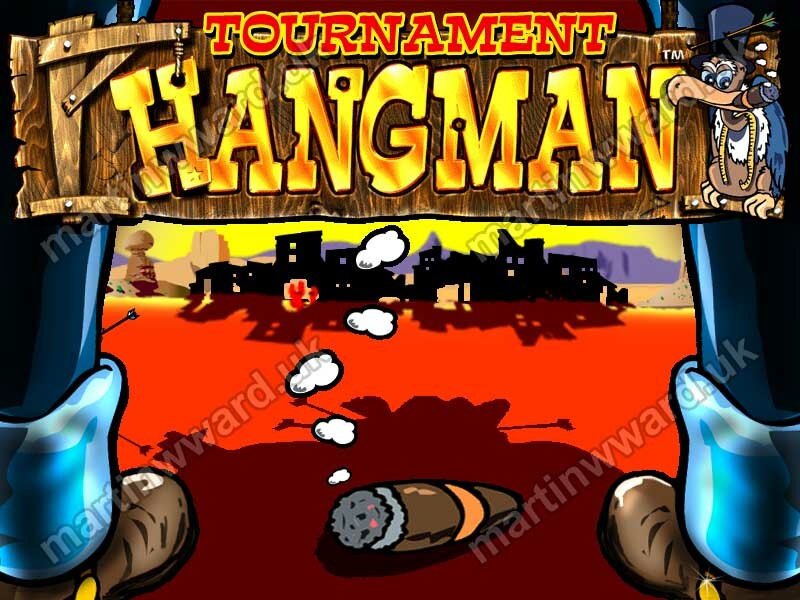 Martin developed his Hangman Tournament game for the GamesNet system in 1999, using his Hangman 2 game as a base. The requirements of a tournament version of Hangman necessitated the removal of all instant cash prizes. 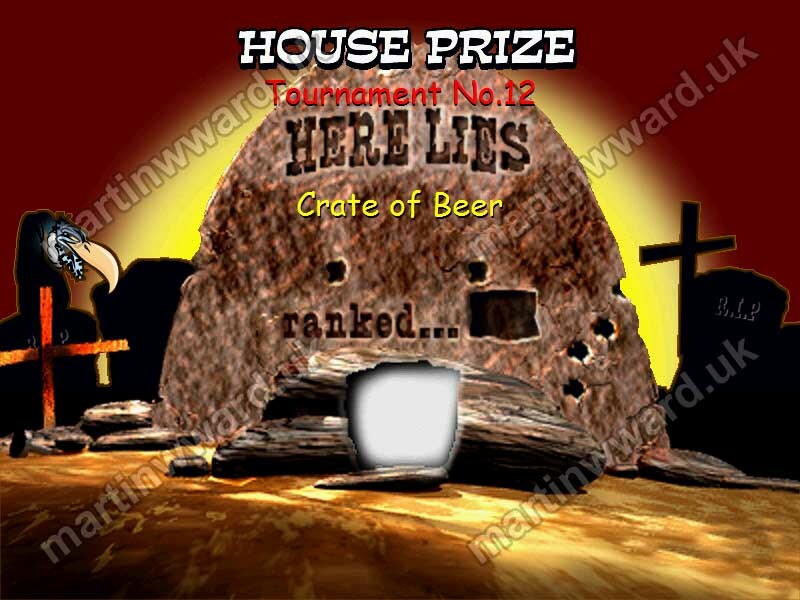 In their place, points-based prizes were added. The points awarded for completing each phrase were also changed. Instead, points are awarded for each individual letter of a completed phrase. Additionally, in the tournament game, points are awarded for every correct answer, in direct proportion to the speed of selecting the answer. Various display pages were required to be added to the game, to enable players to view game information such as the current national high score table, the prizes on offer in the current tournament, and the details of national winners of the previous tournament. All of these pages are accessible from buttons that were added to the main start screen. Communications between the Hangman game client and GamesNet's central tournament server relied heavily on the use of modifying entries in the computer's registry. In 2003 LeisureLink developed a competing national tournament system, using their own ItBox platform. The protocol used on ItBox was largely TCP/IP-based. 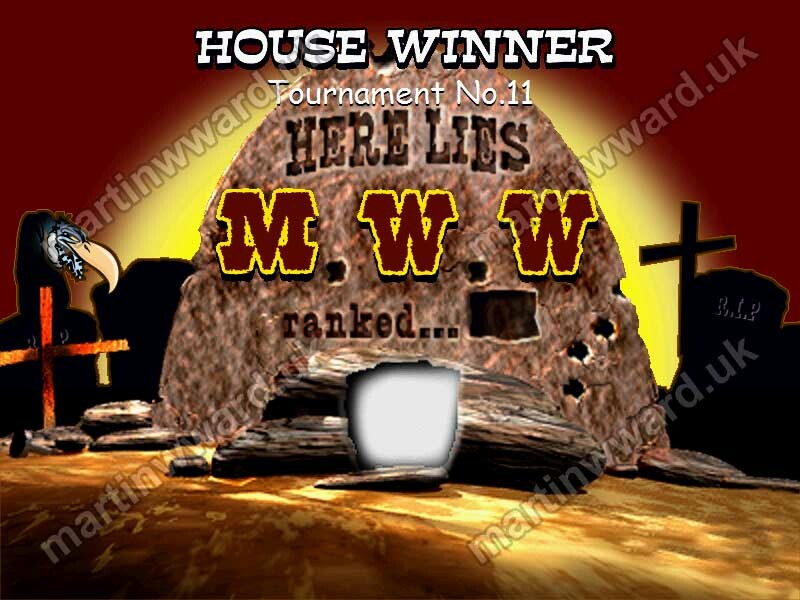 Martin's Hangman Tournament was, once again, one of the first games to be launched on the new platform. Even though the underlying technologies were different, the visual design requirements of both GamesNet and ItBox tournament games remained broadly the same. This enabled Martin to develop a generic tournament wrapper interface that facilitated the development of a single Hangman Tournament game client that could run on either GamesNet or ItBox. Martin completed the generic tournament version of Hangman in 2003. 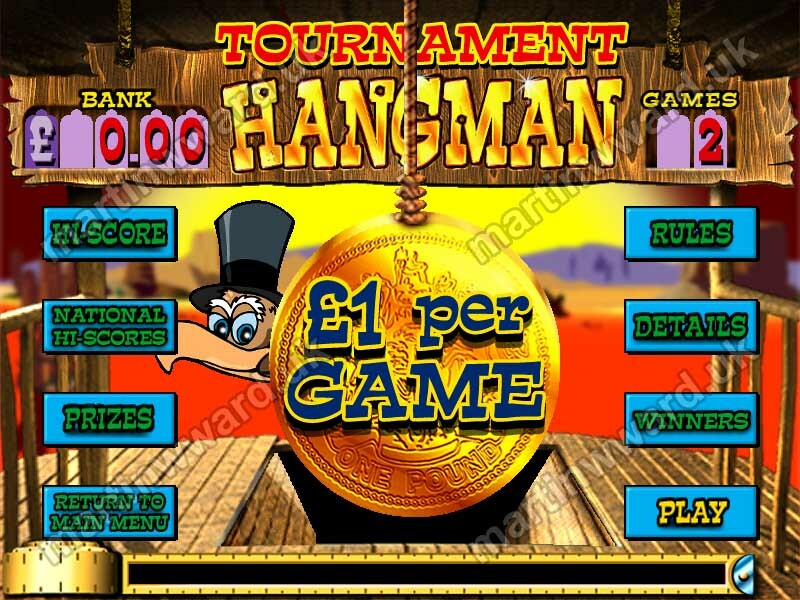 Hangman Tournament was one of the first games to be launched on GamesNet's linked terminals national tournament system. It was released in November 1999. A revised edition, to handle changes made to GamesNet's tournament protocol, was released in 2001. 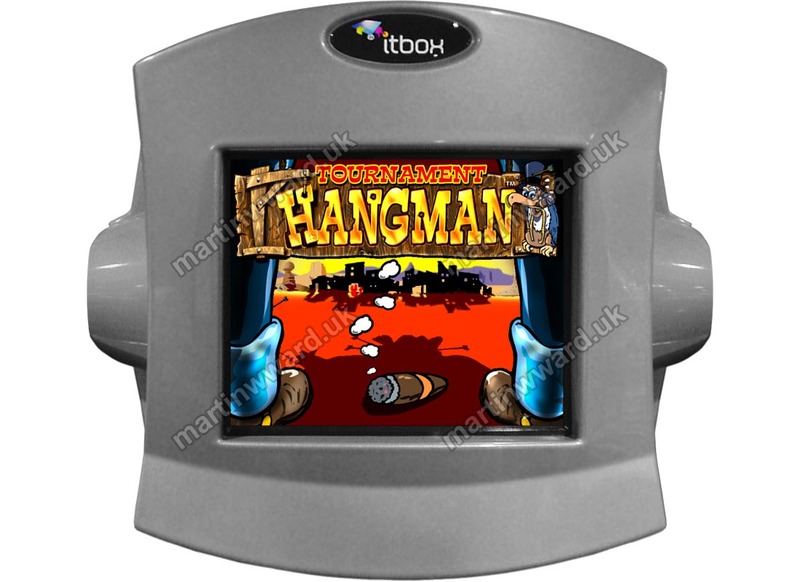 Hangman Tournament was subsequently released on LeisureLink's ItBox tournament platform in 2003.